German voters are about to go to the polls to elect a new government – except, of course, they won’t. Germany’s proportional electoral system has ensured that only once in the history of the Bundesrepublik (1957) has a party won a majority in parliament. 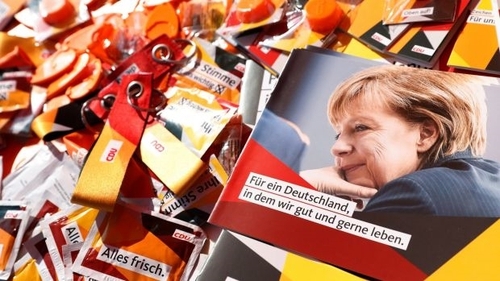 Current polls suggest the Christian Democrats and their Bavarian allies (CDU/CSU), under the leadership of Angela Merkel, will emerge as the largest party but fall short of a majority. They will then have to enter coalition talks. German politicians, not voters, will choose the government. That isn’t a blanket criticism of proportional representation (PR) and multi-party systems. Many countries using PR, such as Italy, Austria and the Scandinavian nations, have increasingly "bipolar" or two-bloc party systems. Loose alliances of parties on the left face rival alliances on the right, presenting voters with a clear ideological choice of governments. The resulting executive might be a coalition or a minority administration relying on supply-and-confidence support from other parties in its bloc. But crucially, voters can vote for a party knowing what government it will likely join or support and which it will oppose after an election. Germany experienced a brief period of bipolar competition from the 1990s, when a centre-left alliance of the Social Democrats (SPD) and Greens faced the centre-right CDU/CSU and their liberal allies, the FDP. But this system was disrupted by the electoral rise of the Left Party, a merger of the rebranded former East German communists (PDS) and another radical-left party in 2007. They had previously fought the 2005 election as an electoral alliance, winning 54 of the 614 Bundestag seats. Neither a CDU/CSU-FDP coalition nor an SPD-Green coalition could command a majority. A "red-red-green" coalition of the SPD, PDS and the Greens would have enjoyed a majority but the PDS was deemed beyond the pale by the major parties because of its communist-era links. That remains the case with the successor Left Party to this day. With the rise of the radical right, anti-immigration Alternative for Germany (AfD), Germany’s six-party system contains two parties (currently polling a combined 20% of the vote) that are excluded by the others, complicating coalition formation. First, they could include the outsiders in a new two-bloc party system, as happens elsewhere. The radical right Progress Party in Norway and Freedom Party in Austria have both participated in governments, while the Danish People’s Party provides supply-and-confidence support to centre-right coalitions. While it is difficult to see AfD being included in this way, the Left Party could be considered, as the communist era recedes into the past. It has participated in a regional coalition with the SPD and Greens in Thuringia since 2014. A red-red-green coalition would retain the left bloc’s ideological coherence and signal to voters the government’s composition if the left won a majority. Second, AfD and the Left Party could continue to be shunned by the mainstream parties. In Sweden, after the 2014 elections, the four-party centre-right alliance could have enjoyed a parliamentary majority had it allied with the anti-immigration Sweden Democrats (SD), but it refused to do so. Instead, a minority Social Democrat-Green coalition came to power, with the centre-right parties later agreeing to pass its budgets to forestall early elections that could boost SD. Yet these parties declined to govern alongside the centre-left, retaining their status as the principal alternative government and seeking to erode SD’s electoral support. Third, the mainstream German parties could engage in more promiscuous coalition-making, with inter-bloc alliances involving the smaller parties. The so-called "Jamaica coalition" (from the colours of the Jamaican flag – black-yellow-green) would see the centre-right CDU/CSU (black) and the FDP (yellow) ally with the centre-left Greens. Similarly, the "traffic-light coalition", would see the centre-left SPD (red) and Greens join with the FDP. Neither has been attempted at the federal level but they have long been mooted. The fourth option is an SPD-CDU/CSU grand coalition. This kind of inter-bloc arrangement has governed Germany for eight of the past 12 years. The problem with inter-bloc coalitions is that they are elite creations. While some voters might be satisfied, it’s easy to imagine left-leaning voters being dismayed at the Greens propping up a CDU/CSU-FDP government. Similarly, free-market liberals might not like the FDP keeping the SPD and Greens in office. Unless these coalitions were signalled as the preferred outcome by party leaders before the election, voters could rightly complain of a stitch-up. That particularly holds true for grand coalitions. They have their place in societies divided by ethnicity, language or religion, like Northern Ireland, where power-sharing is necessary for democracy to survive. They can also be desirable in crisis situations: Britain had grand coalitions during both world wars. Outside of emergencies, however, mature democracies should avoid grand coalitions. They deprive voters of governing choices, as the major rivals are in office together. They weaken accountability, as it is hard for voters to "throw the rascals out". They also undermine strong opposition, a key feature of democracy. An effective opposition party holds the government to account and offers itself as an alternative government-in-waiting. With a grand coalition, small parties are left to provide opposition but none will be viewed as credible governments-in-waiting. It is harder for voter dissent to resonate within parliament when the government controls 80% of seats, as in Germany since 2013. Entrenching an elite consensus invigorates populist outsiders, as the rise of AfD shows. The biggest dilemma is the SPD’s, whose preference for grand coalitions has been disastrous. Left-wing voters opposed to Merkel have opted for the Greens and the Left Party, with the SPD now polling at just 22%. Another grand coalition could inflict long-term damage on the party as its supporters wonder what its purpose is. Or … a minority government? One of the oddities of post-war German politics is the dearth of minority governments. But after this week’s election, the SPD might consider allowing the CDU/CSU to form a minority administration as an alternative to another grand coalition. Germany’s chancellor must win a majority of all legislators in the Bundestag and the SPD could vote for Merkel to enable a government to be formed, but without joining her in office. By returning to opposition, the SPD would then have the chance to renew itself. And for voters, the possibility of minority executives could reestablish a two-bloc system that puts governmental choice in their hands.